My name is Meredith Blakesley, or as some call me ,Merry, and I, alongside my family, own and operate the Lakeside Barn at Duck Puddle Campground. My family is from Carver Massachusetts, home of the Cranberry Bog! That’s right…every time you see Ocean Spray or, well anything cranberry, know its most likely from good old Carver, or “Cavah” as we like to say it!. So from the Bogs, to this, my first blog. I am not a writer, as you have probably presumed by now… but below you can find a brief timeline about Duck Puddle, the Barn and me… with a little history mixed in…in bullet form for your reading ease! In 1978, my family started camping at Duck Puddle ( when I was 2 years old), at which time the barn was home to an arcade, laundromat and some super fun Dances! In 2003 my family purchased the campground, and my younger brother Andy and I began to operate it! At the time, I was beginning graduate school to become a Speech Language Pathologist. Since then I have graduated, got married and had two kids. The campground has gone through its fair share of transitions, including the barn. In 2007 we moved the barn from its original site, at the campground’s entrance, to a sweet little spot across from our lovely field, with some occasional distant but fantastic lakeviews! And The barn returned to house our arcade, with some occasional live music and graffiti! Good reading in the bathrooms! In 2015, we moved the arcade games to a new home next to our camp store, and began the labor of love known as Wedding Barn Renovation phase 1. In 2017, we began the second and final phase (we hope) of the Wedding Barn renovation and hosted 5 weddings! To summarize, I grew up at Duck Puddle, or DPC , as we often refer to it. My heart is here, filled with so many fond memories. I spent many summer days water skiing and tubing, hanging at the playground and drinking slush puppies from the store. 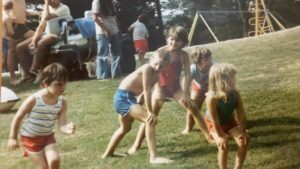 Nights were designated to intense games of Flashlight Tag, humorous and sometimes deep conversations by the fire and occasional dances at the barn, where our parents often showed up dressed in Drag to embarrass us! And then in 2003, we bought the campground. Initially, I felt eager…then came the anxiety. You see, my younger brother Andrew and I had the “pleasure” of running it, with minimal know-how but lots of enthusiasm. Since then, my father has stepped into managing the campground with me, although he had been behind the scenes since we bought it. According to Collins online dictionary, “A learning curve is a process where people develop a skill by learning from their mistakes. A steep learning curve involves learning very quickly.” Let’s just say our learning curve has been more like a roller coaster, with plenty of mistakes to help guide us. But also some truly magnificent ideas have emerged…which brings us to the Barn, finally!! In 2015, we decided to transform our Barn, into what is known now as The Lakeside Barn. The idea spawned from many late night conversations, centered around how charming the barn was, how much character it had, its rustic décor, and its potential to be, what my father referred to as, “a gathering place”. So we made the commitment and began the Labor of love known as the Wedding Barn Renovation. After countless hours of babysitting from my amazing mother, endless late nights of renovations from my husband (almost ex a few times), and boatloads of tears, arguments and hugs, with my father, I am happy to say it is complete. We hosted one wedding the first year, in 2016, and five more in 2017. As of today, we have eight weddings booked in 2018, with inquiries still coming in. We couldn’t be more grateful. Foremost, I must express how incredibly blessed, and shocked, I am …honestly… at the warmth and kindness of the wedding industry here in Maine. I mean, it is truly unbelievable. I vividly remember the first time I attended a Maine Wedding industry event, and it reminded me of when I visited Missouri as a child. As a child, I was visiting my aunt, who resided in Missouri briefly during my uncle’s residency. Upon leaving a grocery store, a gentleman asked how my shopping experience was and wished me a wonderful day. Well, that immediately triggered my Massachusetts side to be cautious and wonder what he “really” wanted… Until the moment I realized his words were spoken with complete sincerity. This same genuine sincerity has been witnessed time and time again within the Maine wedding industry. Two of our mentors/advisors (maybe unbeknownst to them) include Jessika Brooks Brewer of French’s Point, and Maria Northcott, of The Maine Wedding Network and A Sweet Start. They have played a vital role in creating a wonderful community of wedding professionals, who not only support each other, but literally celebrate one another. From hosting events off season, providing us with resources and answering, my often ridiculous, questions, their work is ongoing. The inspiration and guidance bestowed upon my father and I, as well as many others I am sure, does not go unnoticed. And we could not have taken on this new venture without their support….well I guess we could have, but it would have been WAY harder and not as enjoyable. So Thank YOU! Additionally, there are so many amazing vendors we have had the privilege to work in our brief time as a wedding venue, and we look forward to meeting many more. We are so very grateful to be part of this incredibly talented community. So I guess I am “blogging” to shed light on our role as a wedding venue, including our goals and mission. Our mission is to create a magical setting for our couples, their family and their friends. As a destination wedding venue, we hope to cultivate an atmosphere where those who gather can experience quality time with one another, not only witnessing love, but participating in it. We want to do more than provide a space, our goal is to gift our couples with the important stuff…the memories, like the ones I had, and now my kids have. My father has a few favorite phrases, one of which is the “Duck Puddle Effect”. This is the notion that when people finally discover our property, its difficult for them to leave. As a child, I played with children on the playground, who now have children playing with my kiddos. Its truly generational. And our goal is to maintain that sense of belonging, and expand that feeling to include our Wedding Barn. Over the years, my relationship with the barn has transformed. As a young girl making the trek uphill, I always sensed a boldness to the barn, and maybe felt a little intimidated. But today sometimes I look at the barn from my house (because it sits in my backyard) and see it as a maternal being. And to me, She has a sweetness, but still that solid strength, always waiting patiently for Her next group of “people” to hold in Her heart. And I am truly delighted we can allow others the opportunity to love the Barn as much as we do. So here, in stunning Midcoast Maine, a rustic, yet elegant barn sits in the small town of Nobleboro, overlooking a field of dreams and a sacred lake, waiting for its next couple to enjoy all She has to offer. Thanks for visiting and stay tuned for the next Blog!